I have 2 very, very stubborn picky eaters. That’s right…I’m calling out my 2 very favorite kiddos in the entire universe. Daphne & Vic. Okay, so they are barely kiddos anymore, but to me they will always be our babies. Daphne is in college & Vic is in high school, but I still cook for them OFTEN. Daphne thrives on meat. She can eat just a steak and be satisfied 😯 . She also hates most veggies. Meanwhile, back at the other side of the table…Vic loves his veggies . Over the last 16 years I have stressed learned how to get around this “opposite sibling palate” issue. The easy solution? I cook something different for both 😎 . 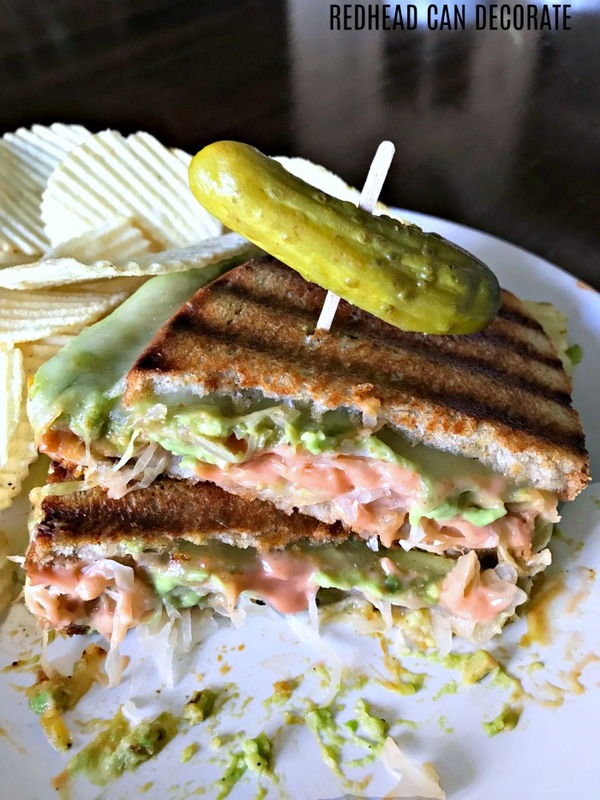 On that note…welcome to Vic’s favorite vegetarian sandwich recipe of all 16 years… the “Vegetarian Reuben Sandwich”. 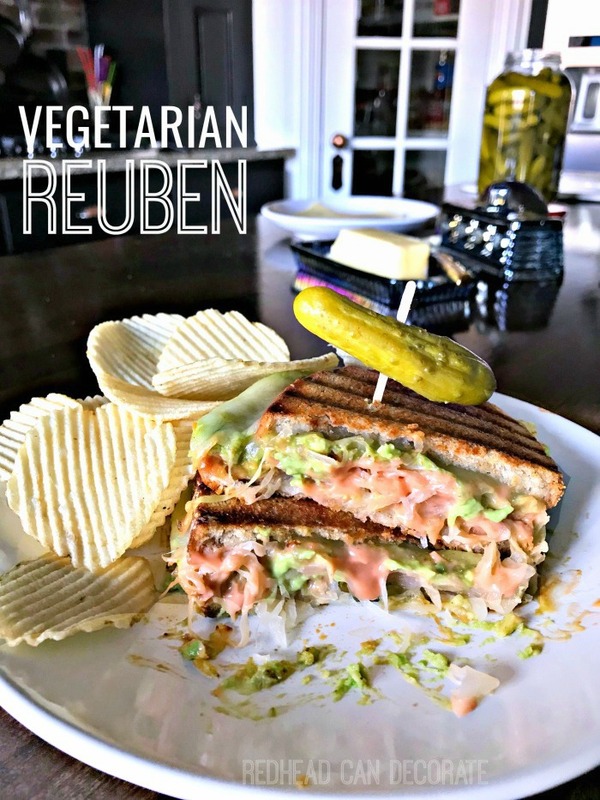 Just so you know-a local restaurant here in SE Michigan makes vegetarian reubens and I had never heard of them before. When Vic ordered one I promised him I would make him one at home because it really did sound delicious and easy. The only element we decided not to use was coleslaw, so keep that in mind if you decide to make one. I figured the sauerkraut was enough cabbage and the dressing tones it all down without adding drippy coleslaw. Now, now, don’t get hangry if you happen to be more like Daphne and can’t imagine your reuben without meat. 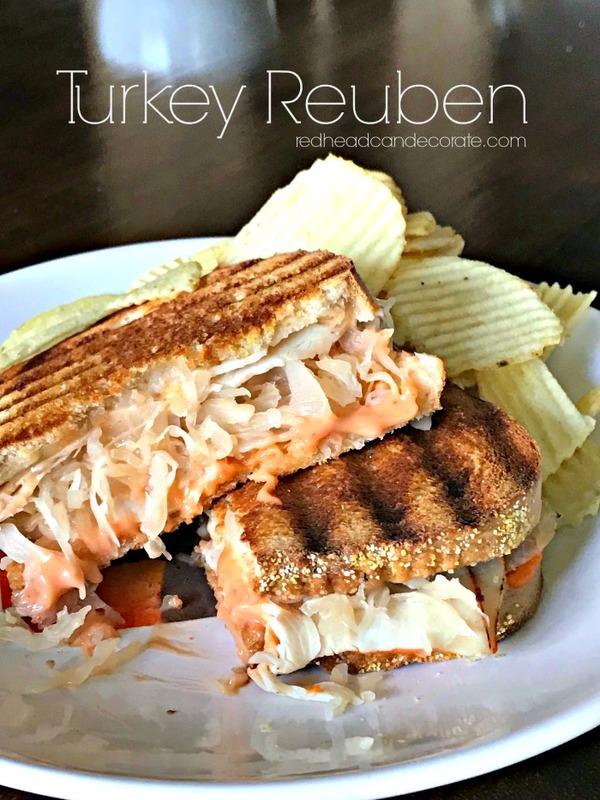 I have you covered with this other carnivore favorite in our house, the “Turkey Reuben”. 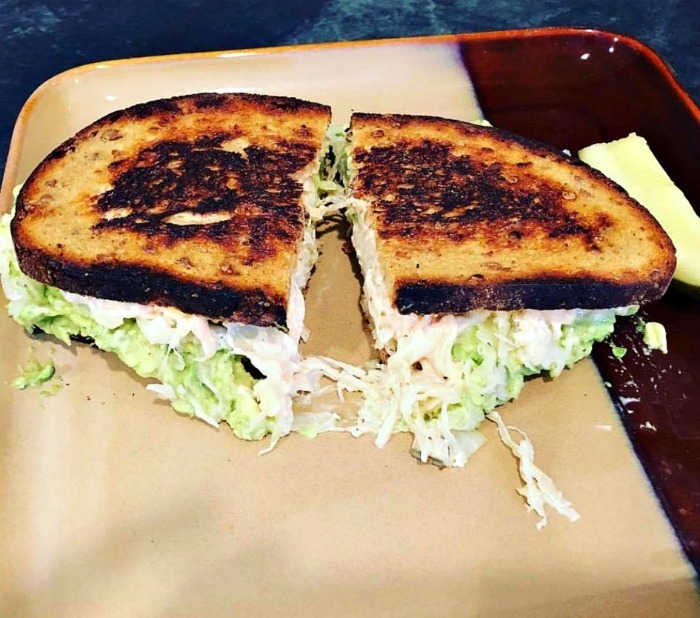 My husband also happens to be a huge fan of the turkey Reuben. In addition, I have two more tasty healthy recipes at the end of this post from two of my very favorite bloggers. Check them out at the very end and tell us all what you think. Before I get into the reuben details, I have to tell you about the Christmas gift my husband gave me after watching me struggle with make 3,000,000 reubens on the stove. He took matters into his own hands and ordered me my very first George Foreman Grill & Panini Press. 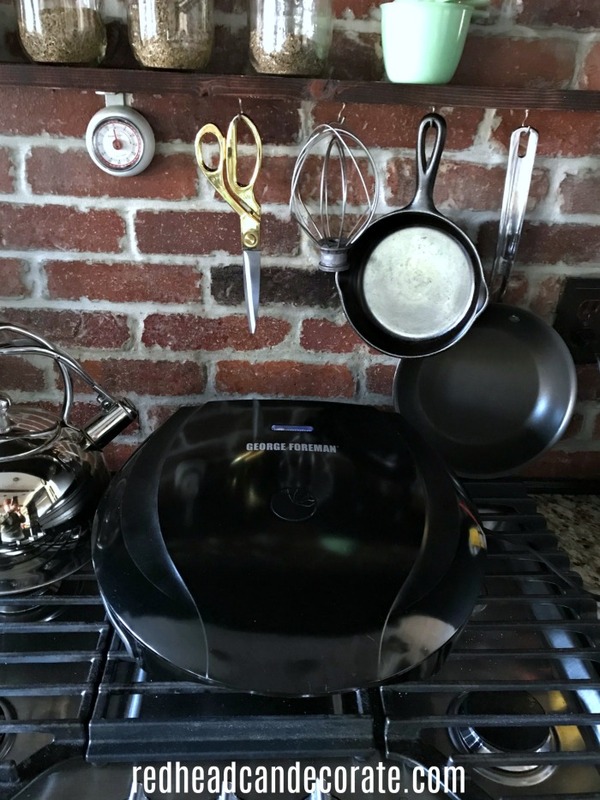 When I told my friends I got my first “George Foreman grill” they acted like I was the last one on the planet to not have one. I guess the only reason I have for not having one is the I was spending so much time making reubens on the stove 😐 . After making both my “Vegetarian Reuben” and my “Turkey Reuben” in the George Foreman Grill, I can not tell a lie. I would never ever lie. EVER. The truth is…it is so much easier. I mean…75% easier. It’s not necessary, but I will repeat. IT IS EASIER. It also comes out more professional looking. Oh, and I love the marks that it makes on the bread. I guess that’s what makes it look professional? 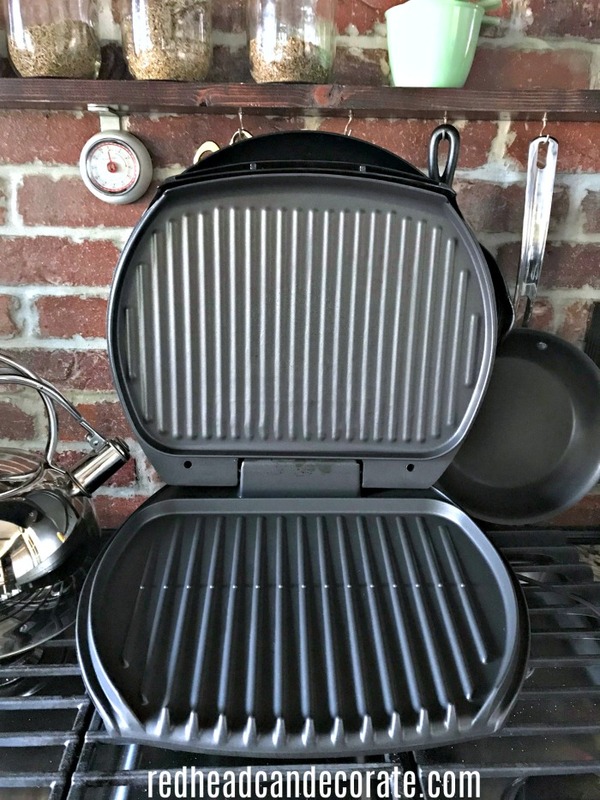 Now…I definitely do not expect you to run out and buy one of these grills just so you can make lines in your grilled “reuben”. Only if you like lines. Okay…enough about George…I better get to these recipes. Hopefully we have convinced you to give it a try. If so, here’s how. 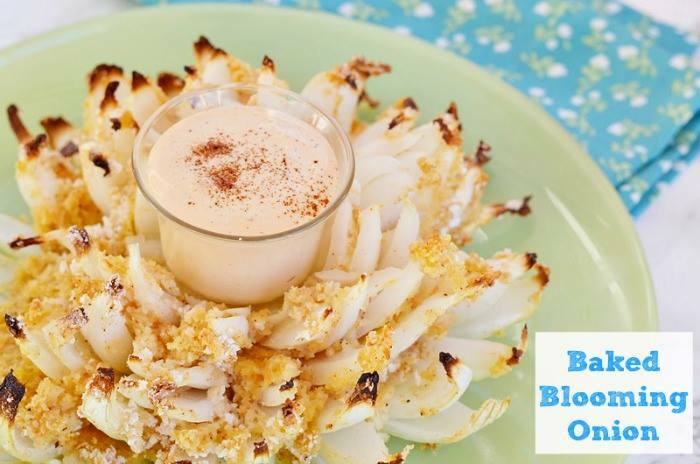 First, the “thousand island dressing” that you will need for every single reuben you make no matter what else you put on it. In fact, it is the most important element in my personal opinion. 4 tablespoons ketchup + 4 tablespoons mayonnaise = what you see in the bowl below, and above. This is enough for 4 reubens. Then swoosh. Close George for approximately 4 minutes, and you have a sandwich that literally slides off the grill onto your plate. 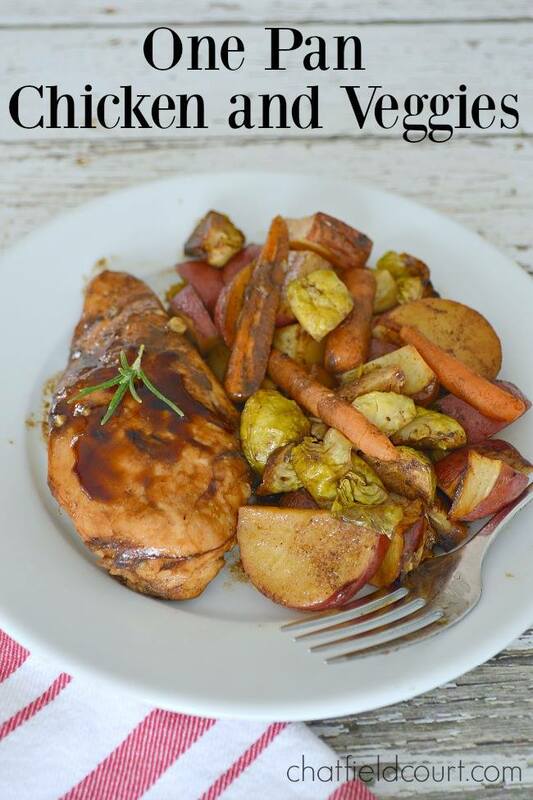 Prepare all ingredients above prior to heating George Foreman Grill or basic pan. Layer ingredients on non-buttered bread in the order you prefer without over stuffing. Butter each side of exterior bread. Grill on George Foreman Grill 4 minutes total, or grill in basic pan approximately 3 minutes on each side at low-medium heat. Serve with pickle & chips! It all looks great, love, Dad in NY. Thanks, Dad! 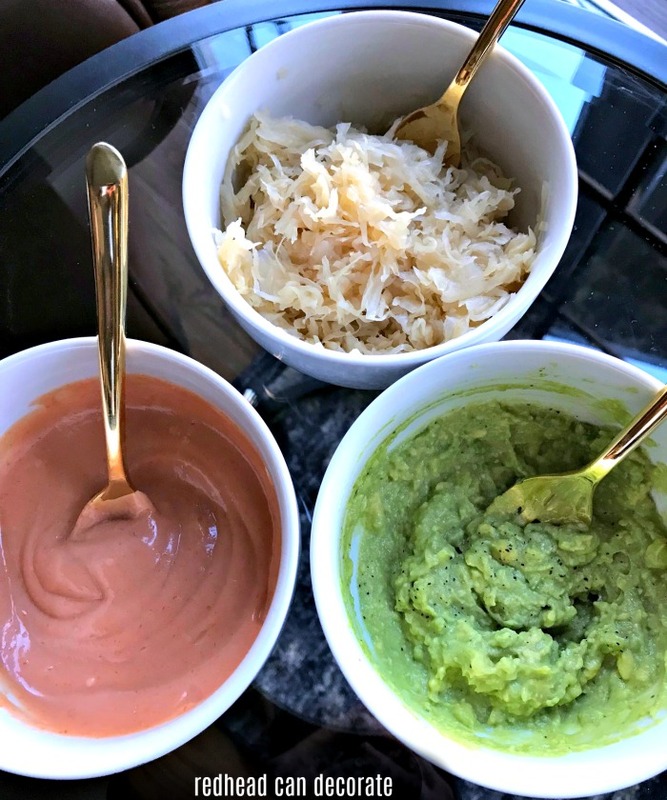 I know you don’t like avocado, but you love that sauerkraut! Oh My Goodness; they look Sooooo Delicious. Now, I have bought a few George Forman grills in my day to give as gifts but I actually don’t own one myself. I would always fix my sandwiches in pan on top of the stove or put on broiler pan and do in the oven. Now that I have myself an air fryer; I do use it quite a bit. My husband and I were discussing an air fryer last night lol. Looks great! Tried a new thing this week. FYI use a hand mixer when you need to shred cook chicken. Takes seconds and no mess. Shocked us at how easy it was. Have a super weekend and enjoy the snow. I must try that, Kyle!! Sounds very tasty Julie! We make a Polish style panini using our favorite rye bread, slices of Martin Rosol’s Kielbasa (our local favorite) and our family kapusta recipe. Not low calorie, but certainly a tasty treat we enjoy. I hope this doesn’t come through twice, I received an error message the first time I tried to comment. 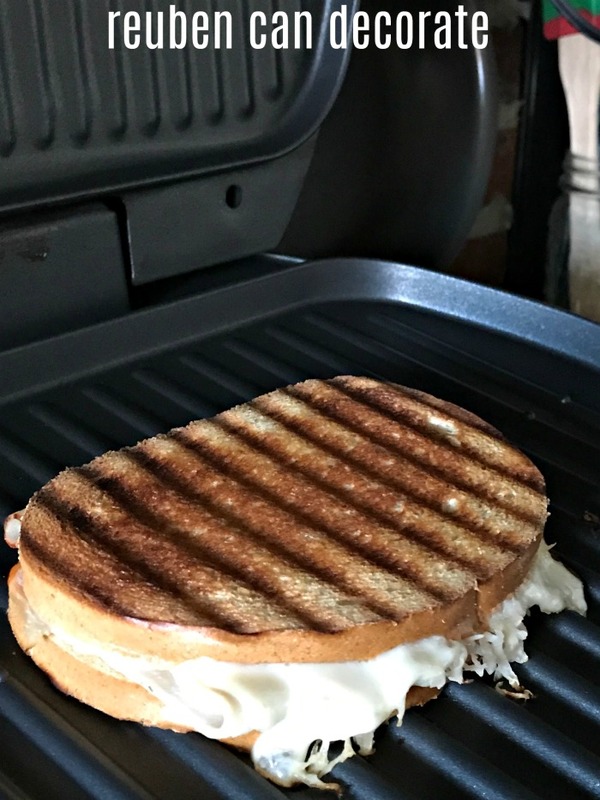 I had a George Foreman for years and finally gave it to my son and bought a panini grill. It’s nice to be able to adjust the lid for bigger sandwiches. The turkey one sounds delicious, will make it tonight for our dinner. Sounds so good, Julie! 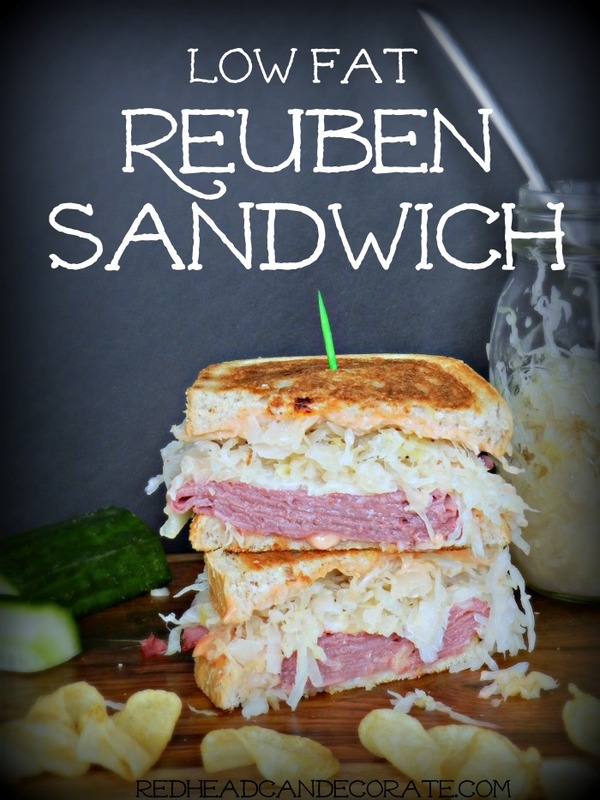 I’m not a fan of traditional reubens because of the meat but this I could do. Can’t wait to try it! 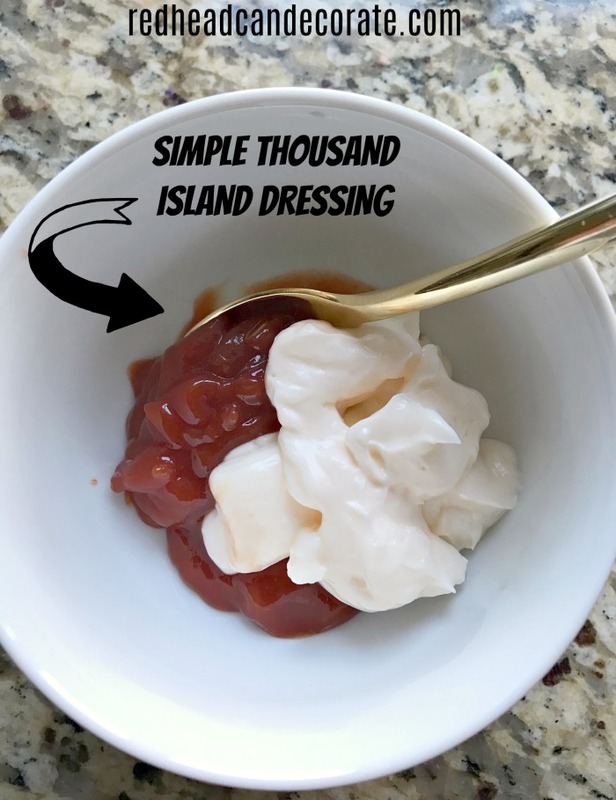 We make our own thousand island dressing too, though we use mayo, chili sauce and sweet pickle relish. I always use sliced turkey but am going to try the avocado. 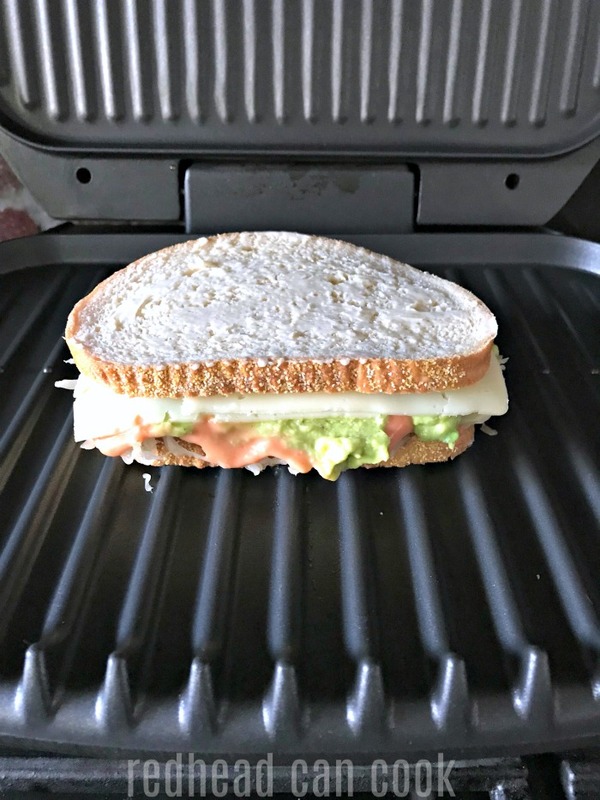 Oh, and I don’t have a panini grill but you make it look like something I should have! Thanks for the tip!